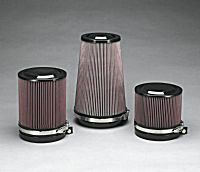 2/1/2003 - Walker Engineering recently announced it is now producing high performance air filter silencer assemblies for MAN and MTU engines. These systems are designed to reduce the high pitched turbo whine of today's modern marine engines. Search MAN or MTU in the Air Filtration category. The units feature a compact design that does not require a turbo connection hose and directly replaces the stock engine air filter. The new style utilizes a postive sealing attachment method that does not require the traditional air filter element springs. Further, the air filter is washable ensuring peak engine performance while reducing the high pitched turbo whine found at "transitional" (louder) RPM ranges. If you have a MAN or MTU engine, then contact us via e-mail today. Be sure to specify engine model, horsepower, model year to request pricing and availability. The units were recently specified as standard equipment for all MAN engines by a leading sportfish yacht builder. Order your set TODAY ! These newly designed "Everquiet�" Air Filter Silencer Assemblies far exceed the sound reducing capabilities of the stock paper or washable engine air filters installed on MAN or MTu engines. Available in sizes to equip just about any MAN or MTU engine, including the new MAN 700 and 450 horsepower single turbo engines.